For current transformers, the program automatically assigns the names CT-1, CT-2, CT-3, and so on. Conn Relay The relay connected to the current transformer. The ID name of the connected relay is displayed here. Conn Bus The bus connected to the current transformer. The ID name of the connected bus is displayed here. Conn Item The item connected to the current transformer. The ID Name of the connected item is displayed here. Group Name/Type If the CT is part of a functional group, the group name and type appears here. See Functional Groups. CT Function Number of current transformer ratios. You can select either Single Ratio or Multi-Ratio. If you select Multi-Ratio, you also need to enter the CT ratio that has been set. Connected The connection type. You can select either Wye or Delta. CT Ratio The ratio of rated primary to rated secondary amps of the current transformer. Specify both ratings in the form: (primary amps) / (secondary amps). The ratio that has been set in the case of multi-ratio current transformer. No. of CTs The number of current transformers in the group. If you select this check box, the current transformer appears connected to the relay with a line. If it is not selected, the entire line is not shown. TO (Relay ID) appears next to the CT symbol as shown below. 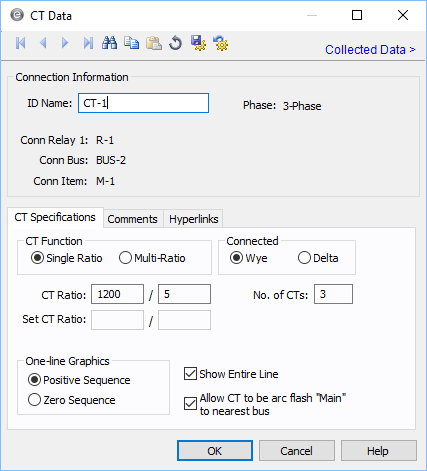 Allow CT to be arc flash "Main" to nearest bus When this option is selected, the protective device connected to the CT is treated as Main in arc flash analysis. Tip: To change polarity on a CT after it has been added to the one-line, hold the SHIFT key and drag the leader line closest to the CT downward. The CT and relay must be slightly offset for this to work.